If you are not pleased with any product by OKRAY, please do not hesitate to contact us first and we will do our best to solve your problem ASAP! DJI Inspire 1& Phantom 3 Remote Control, Android, Samsung Galaxy Grand Prime/S6/S6 Edge/S4/S4 Active/S4 zoom/S3 mini/LTE/Core Prime/A3/Mega 2/Alpha/Touch3/Note Edge/Note 4/Avant/mini I9190/Light/S IV/Tab A/Tab S/Tab 4 4/ Tab 3 Lite/ Note Pro/ Tab Pro/Note LG Lancet, Leon, G Stylo, G4, G Flex 2, Optimus F60, Tribute, G3 Vigor, G Vista, G Pad 10.1, G Pad 8.0, V400, G3, Volt.Motorola Droid Turbo; Google Nexus 6, Moto E (2nd Gen.), Moto G (2nd Gen.), Moto X (2nd Gen.), Moto E, G, X .Blackberry Classic, Passport, A10 / Z30, Q10, Z10, Curve Series; HTC Desire 612, EYE, 816, One M9/ (M8) For Windows, One (E8)/ (M8), One mini 2, Desire 610.Acer Aspire Switch 11 10, ICONIA Talk S, TAB 10, TAB 8 W, Tab 8, A1-830, A3-A10, W4-820, TAB A110, VivoTab 8, Transformer Book T300 Chi/ Book T100). OKRAY's USB cable helps you maximize your performance when charging and transfering data. 10 pack is ideal for your home, office, travel, and car. OKRAY's cable is made of premuim quality materail. Each of cable is built for connecting and disconnecting over and over again without signal loss. Perfect Size: 1ft (30cm) is right length for your portable power bank/multi-port usb charging staion/even purse. 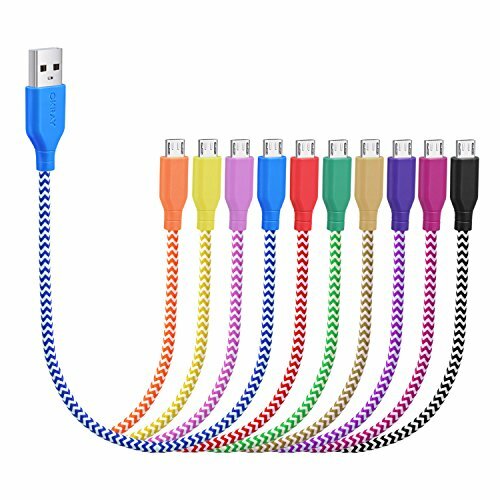 No tangling and less space occupied is very convenient for you. 10 Pack can meet all your demand. Every device can have its own color. Snug Connection: The micro USB connector fits quite snug in phone charging port. Very easily plug the charger. Super Flexible and Bendy: Braided Nylon jacket makes cable more duarble. 6000+ bends tests make cable sturdier than ordinary cable, even can stand up to pet's biting. 24 Month Warranty: OKRAY 100% stand behind our product. If these cable can't meet your expectation, just feel free to contact us via Amazon email. OKRAY Customer Support will help within 24 Hours.